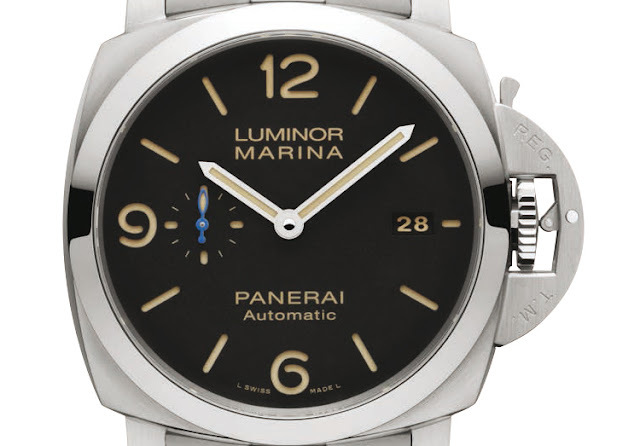 Officine Panerai recently presented two new Luminar Marina 1950 models fitted with a new steel bracelet smoothly integrated with the thinner 1950’s case presented in 2016. The Luminor Marina 1950 3 Days Automatic PAM722 has a diameter of 42 mm while the Luminor Marina 1950 3 Days Automatic PAM723 is slightly larger at 44 mm. Features of the two new models are the same of references PAM1312 and PAM1392 fitted with leather straps (we wrote about them here). winding crown, like the first bracelet created by Panerai in 1999. Each link integrates perfectly with the rest – without any screws – forming an ergonomic bracelet which is flexible on the wrist. 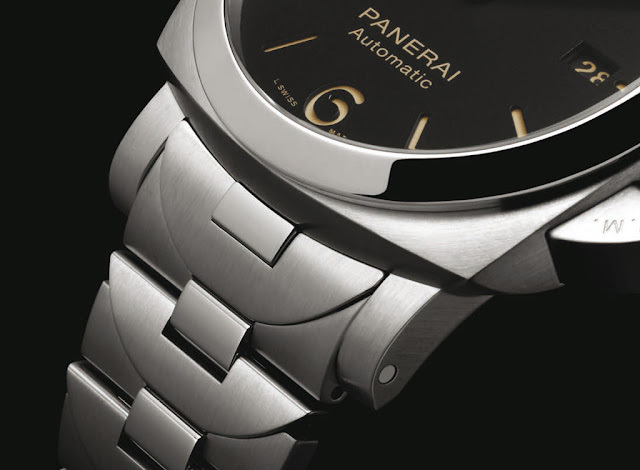 Robust but much lighter than those previously developed by Panerai, the new bracelet is made of AISI 316L stainless steel, the same as the Luminor 1950 case. Polished and brushed surfaces alternate, well harmonizing with the case which has a brushed finish with a contrasting polished bezel. Together with a thinner and lighter case, possible thanks to the fact that the automatic P.9010 calibre is only 6 mm thick, the new models feature other novelties like the word Automatic on the dial, luminous beige markers and a small blue hand for the seconds counter at 9 o’clock. Dials are black with the typical sandwich structure. 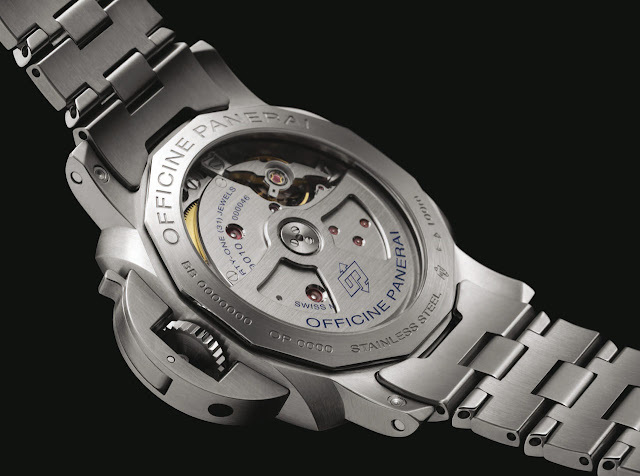 The automatic P.9010 movement is visible through the wide sapphire crystal porthole set in the back. The calibre, made entirely in the Panerai Manufacture in Neuchâtel, has a power reserve of three days and it is wound by a bidirectional oscillating weight. It is fitted with the device for stopping the balance wheel when synchronising the watch and the system for rapidly adjusting the hour hand, which can be moved forwards or backwards without interfering with the running of the seconds hand. The balance is fixed by a bridge with twin supports and it oscillates at a frequency of 28,800 vibrations per hour. 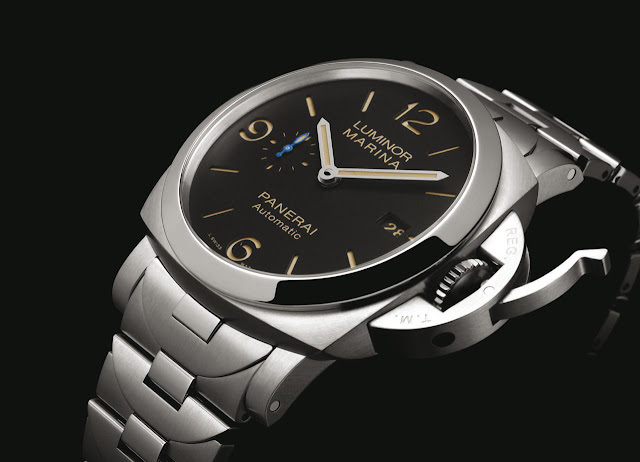 Officine Panerai Luminor Marina 1950 3 Days Automatic with new steel bracelet. 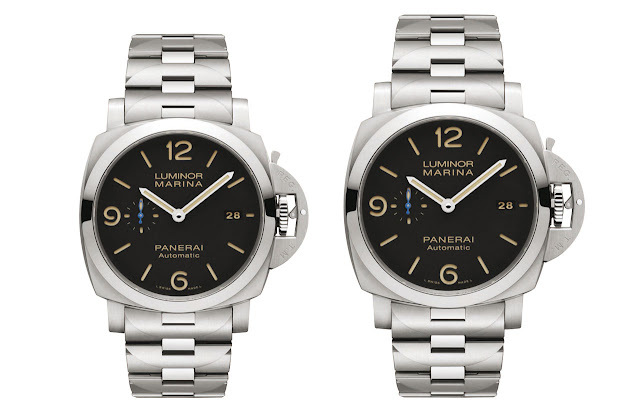 Officine Panerai presented two new Luminar Marina 1950 models fitted with a new steel bracelet smoothly integrated with the new 1950’s case presented in 2016. The new Luminor Marina 1950 3 Days Automatic PAM722 has a diameter of 42 mm while the Luminor Marina 1950 3 Days Automatic PAM723 is slightly larger at 44 mm. Prices: US$ 8,100 / Euro 7,900 for the PAM722 and US$ 8,200 / Euro 8,000 for the PAM723.